The first time I did a layered look was by coincidence. I was at an event where I got to try out the new collection. Lucky for me this was one of those few plus size friendly brands. After finding the courage to wear a sleeveless sheath dress – not a silhouette I generally wear - I needed something to layer it with. In the spur of the moment I picked up a light weight beach kaftan. While the two pieces were absolutely opposite - one a cocktail dress the other a cotton wrap – together, they looked great. With that one look, I started my love affair with plus size layering. 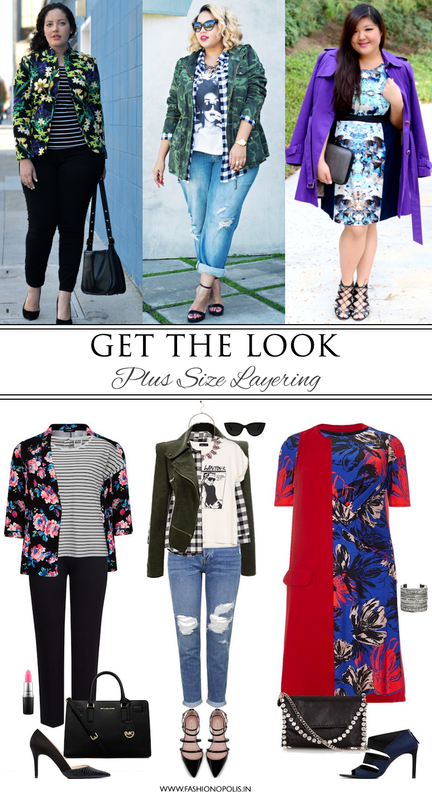 As a plus size fashion blogger I am always trying out new ways to layer pieces - mix and match and create new looks. When I like a piece but it tends to be a tad bit snug, I generally use it for layering. That's how I manage to make the most out of the limited available options. I have tried innovate and interesting ways to layer my outfits. I have paired a maxi dress (styled as a sleeveless jacket) with a kurta, done a kurta on kurta look, dress, tunic and palazzo pants combo and many more. The options are limitless. You just need to find the combinations that works for you. My biggest source of inspiration are some of my fave plus size fashion bloggers. Their effortless layering and chic styling has inspired me to try out novel looks that I would have earlier been too scared to try. Along with inspiration, they give me the confidence to not shy away from experimenting with fashion.